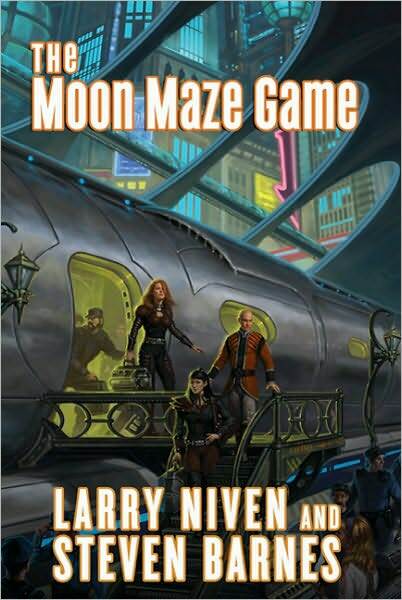 The Moon Maze Game, by Larry Niven and Steven Barnes, Tor paperback, 2012. Writing a review like this is unpleasant, but then again so was reading the book. 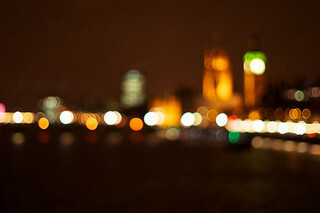 I kept hoping it would focus and thrill. As a fourth entry in the Dream Park series, it rates much like the fourth entry of the Indiana Jones movies. It had a few cool ideas and brief appearance of a familiar face, but it was far weaker than the original three stories. There were many poor aspects of the tale, but it just reminds this reader of stories I haven’t even reread in ten years, and I remember Alex, Tony, and Mary-em far better than anyone in the MMG a week later. 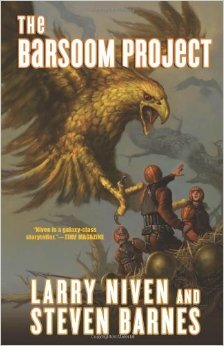 For the first, the cover is static and none of the people or props are anything but generic SF future. 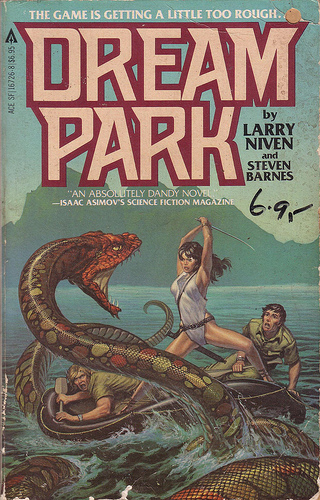 The most recent cover for Dream Park even features a white dragon, a bit out of place for a south Pacific setting. Better covers give some kind of hook into character, setting, or an action scene to draw you into the story. This cover looks like some kind of train station and no characters are particularly identifiable. One great character has a mobility pod for her handicaps and a major role in several major sections, but wasn’t on the cover. There were some very tense places, scenes that could have caught attention on a cover without spoiling the plot. Instead we get a station that says nothing about the conflict or events of the story. With these two covers, we want to know what happens next, that’s the most important part of storytelling. The swordswoman with the men hunkering down, gives a different view from the usual cover. Now, I know the authors have little to no influence over the covers, unless they are selfpubbed. But the cover is one of the best hooks for a new reader, but this third cover could be almost any future SF. The story has people of multiple ethnic, gender, ableism and what is on the cover? Just whites. The only hint of the game setting is the railing and the lamp, even though the game setting is supposed to be immersive. The cover fails on every level. Now many covers fail, but that is not a good sign. Now the biggest problem is plot, all the other problems are a consequences of errors there. Like the other Dream park stories, the world-building before we get to the game is dense, but the rest of the story feels rushed and sketchy. Subplots and characters introduced are dropped and the IFGS game become nearly irrelevant to the terrorist-kidnappers plot. The GM shows more personality in flashbacks and there seems to be no Loremasters. A grudge is a chimera. A strongly implied subplot of Lunar freedom, ala Moon is a Harsh Mistress, is really wasted space that is meaningless, when almost all conflict once the game starts is related to the kidnappers. (who are only threats because of their ruthlessness and not their competence) The vanity celebrities in the story fizzle instead of adding tension or sympathy. Since characters’ goals and actions are what grab the readers’ sympathy, fear, and thrill, putting too much emphasis on world building makes a boring story. The story felt like it was only to fill in events between Dream Park and much later books in that universe. The Moon Maze Game is so ruined by the political kidnapping, that there is no setting, no immersion. You never get much feel for the game layer of the plot and most personal plots are staked through the heart too. The three overlapping levels of story never coalesce, unlike the earlier books. The book is simply too short to do justice to all the characters and plots introduced. There were some good scenes and a very few decent characters, but reading it was like reading a detailed outline instead of a dramatic epic. The most promising characters were only in brief sequences, and several central characters never quite came to life. The game becomes so much window dressing that there is almost no awe and wonder, no immersion, no tension to solve the game as the players get extra help so they can escape the criminals. One subplot ends in a thud after not being mentioned for a couple hundred pages. Now my review went on rather longer than I expected. If you want a kidnapping/escape story, it’s okay, but this is not really a Dream Park Novel. Read the other three: Dream Park, California Voodoo Game, and Barsoom Project. Read this one only if you want to meet Alex Griffin’s daughter in law (her sparse subplot could have carried the story better than the kidnapping). This kind of column seems almost obligatory, where sites, blogs, and even channels give their thoughts, progress, and best picks list for the last year. Well this is a new blog in a quiet corner of the internet, and if I post the top ten posts according to downloads, this might include every single post. That seems a little much of a feedback loop and the audio squeal would hurt my ears as much as yours. Progress is a little harder to pin down from here in the trenches. Am I a better writer in the last year? Maybe a little: I haven’t been completely had writer’s block this year. While I’ve written posts here or cheesy drabbles that will never see the light of day, I haven’t been unable to write at least something when I wanted to. “Real life” has been a major problem between health and major household issues with a furnace. It’s rather hard to write under a literal mound of blankets, but I don’t call that block. Exhaustion and broken sleep schedule is starting to resettle a little. Procrastination was beaten on a bit as a completed a project: layout, proofing, cover and all on a partly self imposed deadline. I submitted a short story for publication, and it was rejected. Par for the new writer’s course. I finished six short shorts towards a collection to self publish, but it’s not quite enough for a sale package, so I missed that deadline. I finished trying out writing a game module, but that removes the story a little too far from the reader. Made the date, but not the timezone, another rookie error. So my smaller projects were disappointing, but not worthless. During the holidays I found a place to submit stories for publication, and that might supersede the collection. Submit flash stories for creditable publication is a high priority for the new year. Tradition for the SF/F genre is to cut your teeth on short stories and then step up to novel length and series. Many of the old name authors started that way, though there were exceptions. Lesser known until recently was that fanfiction was also a training area for writers like Asimov, Lackey, and McMasters-Bujold. Novel length gives so much more room for character growth and change, even from inside anothers’ sandbox. I did not manage to finish my last major fanfiction by my deadline, though much of the reason was that I was doing the items listed above. The two month frenzy and collapse around NaNo left me with a 70k word first draft. Those two items are the other two high priority writing tasks for 2015. Finish the fan fiction story! I think that finishing the story for your fans is important. If they have been reading and bookmarking and commenting for ten, twenty, or seventy chapters of a trilogy it’s a kind of contract to finish the thing. The ending of a story makes of breaks it. An unfinished ending is the worst kind of break. This isn’t like a paper series where the publisher doesn’t want the expense and loss if it doesn’t sell. Fan fiction is free. I suspect I may continue to do the occasional short in the future, but this will be the last major piece. Finish my original story, the one I did for NaNo. I was burnt out by the NaNo push and worked on three other chapters since then, but I need to finish maybe another 10k for the draft and then revise that. If wishes were horses, I could afford an editor to help clean it up, so it will be slower. The fourth thing is transition from amateur to professional. That is in many ways more important as the first three. Writing steadily and deadlines are only part of it. I need to keep an eye on the industry, read about and talk to other writers, look out for financial and legal potholes, and take advantage of whatever training I can manage to get. Now some things I don’t plan to invest the time in, social networking is fine, but I know that is a timesuck for me. It comes down to having time to write or time to be active on sites. I just have to remember that writers, most writers I respect, were successful before these existed. I plan to be retro. Keeping up with these things is already over an hour most every day and that is a big chunk that must be pruned, no matter how horrible and enthralling these trainwrecks are. I like challenges and external deadlines, so I will be doing Holly Lisle’s Ugly Baby Challenge. So much to do. Wish me luck, and I wish you the same for your plans for 2015!